An excellent UK-based maker of pure and natural but effective skin care, using non-toxic ingredients, without parabens, sulphates or artificial perfumes. 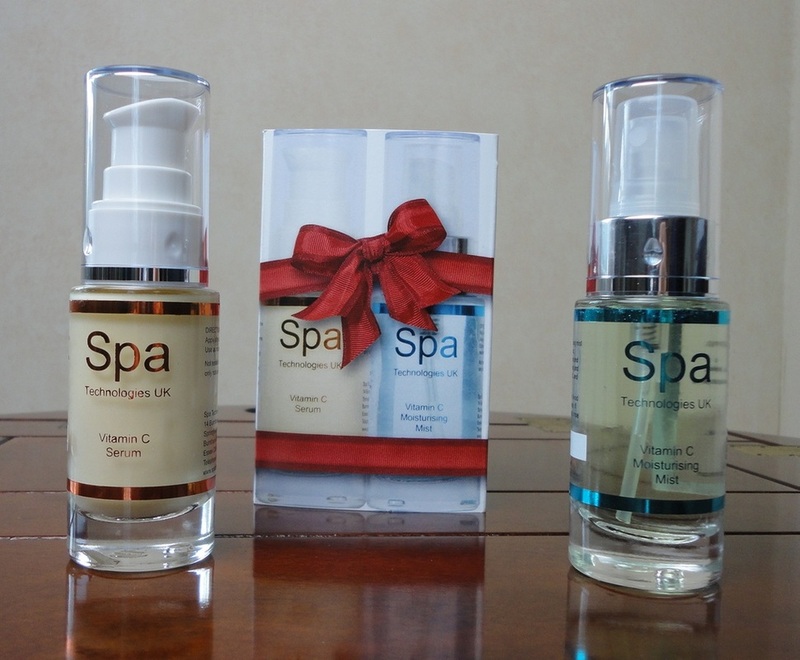 All Spa Technologies products are certified Vegan-friendly and cruelty-free (not tested on animals). Their manufacturing standards are exceptionally high and so are the concentrations of active ingredients in the mix. Each product is formulated with a unique recipe of active ingredients such as plant extracts and essential oils in a 70% food-grade seaweed base. Serious and responsible skin care at surprisingly affordable prices. I seldom link to other websites but was so impressed with what I read on the Spa Technologies UK site that I decided to make an exception. I think you will be, too. This is a truly fabulous product. If you think face masks are a waste of time or too messy to bother, this mask may just change your mind. I've had a chance to try many clay-based masks lately, and they are either powders that you mix yourself, or premixed and ready to apply. There is no question that the premixed is much more user-friendly. This mask is of the latter sort, it's a smooth, silky, thick creamy preparation, with a deliciously fresh herbal smell, and really easy to apply. The spa treatment starts the moment you apply the first layer; refreshing does not really describe it, it's like a spreadable ice pack. I like to put this one on quite thickly, it just feels right. 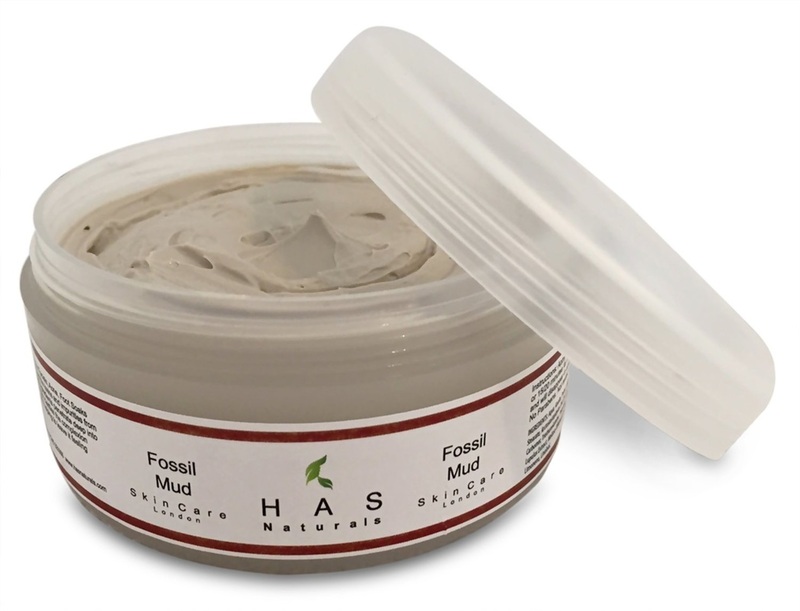 The product description lists many natural extracts; without repeating everything here, I noticed fennel, bearberry, chamomile, yarrow, melissa (lemon balm), almond oil, kaolin and bentonite (two natural clays). Although suitable for all skin types, you can customize your use: for sensitive skin, leave it on for 10 minutes; normal to oily skin, 20 minutes. I have tried it both ways and now leave it on for 25 minutes; I have not experienced any redness even temporary, so my skin tolerates the active ingredients really well. I have used premium skin care for years now, and only accept a fraction of the offers I receive, but was glad to try a free sample of this new brand because HAS Naturals is marketed by the same company that also makes Spa Technologies, another excellent brand I like very much. They are serious about compliance with regulations and are awaiting official accreditation with the Vegan Society. I love that it is not tested on animals, has no parabens, but contains some of the most powerful moisturizing and anti-ageing ingredients available. Another thing I really love is that the product is packaged in a large, shallow jar, which makes it very easy to use. To keep things hygienic, just use a spatula or spoon to lift the product out. This mask works on different levels: cleansing, emollient, nourishing and tightening. I'm using it twice a week, and find it excellent. I had a persistent case of pink, irritated skin either side of my nose; just a few applications calmed the irritation and made it disappear. Excellent product backed by a remarkable 60-days guarantee. 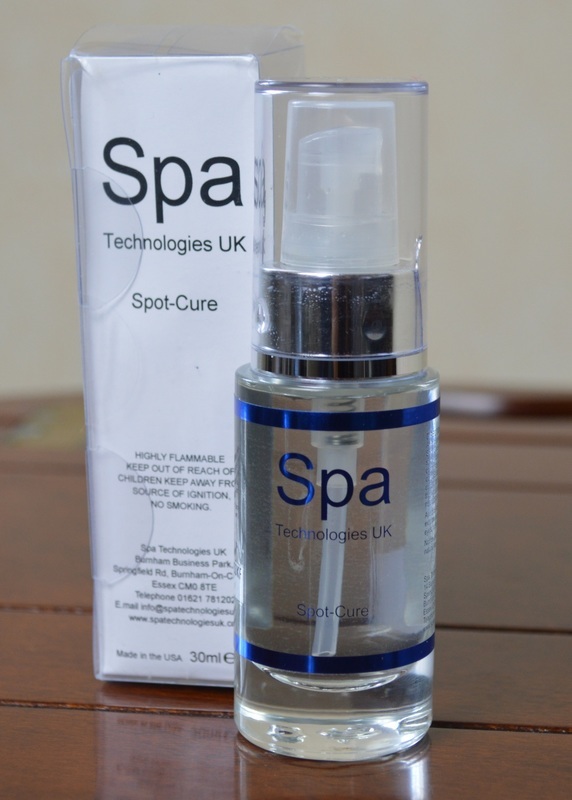 I have tried quite a few eye-specific products lately, and this creamy and luscious treatment from Spa Technologies ranks with the very best. It has all the things I look for in skin care: natural ingredients, no parabens, sulphates or other toxic elements, a light and penetrating texture, it is safe for sensitive skins, is a cruelty-free product and does not cause breakouts. Among the active ingredients are the most effective compounds in use today such as Hyaluronic Acid, Vitamin E, and Vitamin C esters (which are said to be much more beneficial than the more common ascorbic acid form of Vitamin C), as well as arganine, and rice bran and soy proteins. However impressive a list of ingredients, the main test of skin care is how it performs. As usual, having accepted this serum for evaluation, I discontinued my previous regimen and started using it exclusively, twice a day after cleansing and before moisturizing. Only a tiny amount is needed to treat the area around the eyes so, in my experience, the 15 ml of product should last a couple of months. I have been using mine for three weeks now and the bottles still feels full. The pump dispenser is very responsive and the creamy preparation can be extracted really accurately with no waste. I find that I can apply this serum to the eyelids without any problems, and it does help tighten my skin in a gentle way in this very sensitive area. Although it's probably early to see the full effect, I have noticed a pleasing improvement. The “laugh lines” at the corners of my eyes look much less pronounced after my morning application, puffiness is reduced and my skins feels pampered and softer. I would like to see a more visible effect on the dark circles under my eyes, but I fear my lifestyle is partly to blame. I really should get more sleep! However, I have received a couple of unexpected compliments from people who don't see me often, who thought I looked more rested, and my husband thinks my wrinkles are less evident, so I'm pleased with that! This new brand is really impressive, and I'm delighted to have been given the opportunity to try a complementary sample. I have been burning the candle at both ends for over a year now, and not surprisingly my eyes betray my chronic lack of sleep. Age has something to do with it, as well, so puffiness and black circles are daily problems for me. This product arrived on Boxing Day and, as usual, I switched to it exclusively, discontinuing my previous eye gel. I was using an excellent product before, so was not sure how this new one would compare. After a month-long test, I am very happy to report that this Rectify Eye Cream is every bit as good as my previous “star” gel. I particularly like the decongestant effect, very obvious when my eyes are visibly puffy. I think it's the Caffeine and Aloe Vera combination that works so well for me (I have noticed that caffeine-based cellulite creams seem to be the most effective for me). 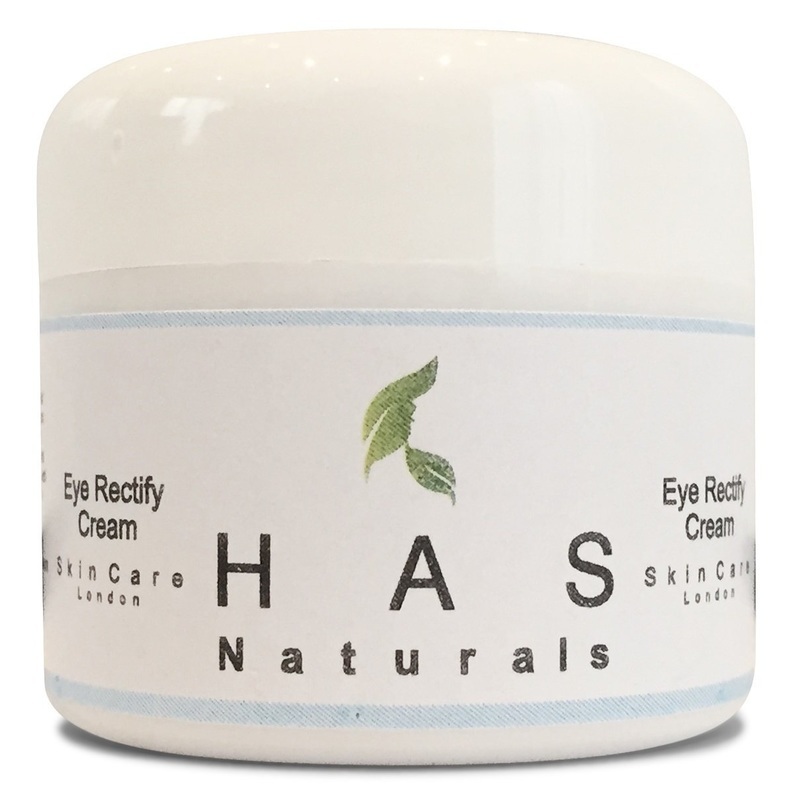 The other active ingredients are Hyaluronic Acid (classic anti-ageing ingredient), Borage Seed Oil (anti-inflammatory), Hemp Seed Oil (Omega 6) and Eyebright (Euphrasia officinalis) Extract, a herbal remedy for eye infections. I love that the cream is made of natural products, not tested on animals and devoid of toxic content. There is such a choice of these all-natural products now that it's easy to avoid “the rest”, however glamorous the celebrity face paid to advertise them. The jar looks small but it contains 20 ml of product, which is a little bit more than the usual 15 ml for specialist eye preparations. Although I don't mind functioning pump dispensers, I have a preference for jars; it's easy to see how much cream is left, and I know I'm getting every last drop. The consistency is midway between a cream and a gel with the mildest herbal scent, the effect is immediately refreshing. The cream is absorbed quickly and fully; I use it as a treatment product and top it with a day or night cream, as my 62-year-old skin requires layers of nourishment. On younger skin, it may be all you need, especially for the daytime. Even with twice-daily applications, after a month I still have half a jar left, so it is very good value for the price. 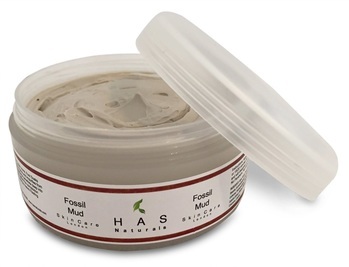 Excellent skin care, just as good as their Fossil Mud Mask. I haven't suffered from acne breakouts since the menopause changed my hormonal profile, but occasionally stress, or excessive consumption of cheese, still trigger a hot little spot on my chin or elsewhere on my face. This powerful liquid delivers quick results and the inflammation is usually gone by the next day; sometimes a second application is necessary, but I still consider this as outstanding compared to my previous acne gels and creams that would dry out my skin and irritate the whole area without really dealing with the sebum. The glass bottle holds 30 ml and has a pump dispenser which is great for application on areas like the back and shoulders, but for the face I usually spray or drop a small amount on a cotton pad because I find that the fine mist can get in my nose. I just wish this product had been available years ago when I really needed it. It would have been life-changing! It has also been brilliant for my husband. Recently the skin on his chest broke out in an allergic reaction to something. This spray, combined with Aloe Vera gel, has calmed the inflammation and stopped the cycle of re-infection. This acne remedy really exceeded my expectations, I've never seen anything work so fast for spots. This is a difficult product to describe but strangely addictive once you start using it. I find myself using this much more than I imagined. It is a moisturizing toner in a spray bottle, intended to be used as a facial pick-me-up after cleansing or, even more usefully, over make-up. I had to try it to believe that it would not make my mascara run, but it doesn't. I really love this bracing, refreshing spritzer, and use it several times a day. The spray is fine and, with a little practice, it's easy to perfect your application skills. The bottle holds 30 ml, and has been lasting me well. After a test period of 3 weeks, I still have lots left. The formulation is based on sea water with some very effective anti-ageing ingredients like Vitamin C esters (a vastly superior form of Vitamin C), Vitamin E, Hyaluronic Acid (a powerful collagen facilitator), Aloe Vera and algae extracts. I don't see it mentioned, but to me this toner has a delicious scent of orange, a large part of why I love using it. Or perhaps it's the honeysuckle extract, used as a preservative. 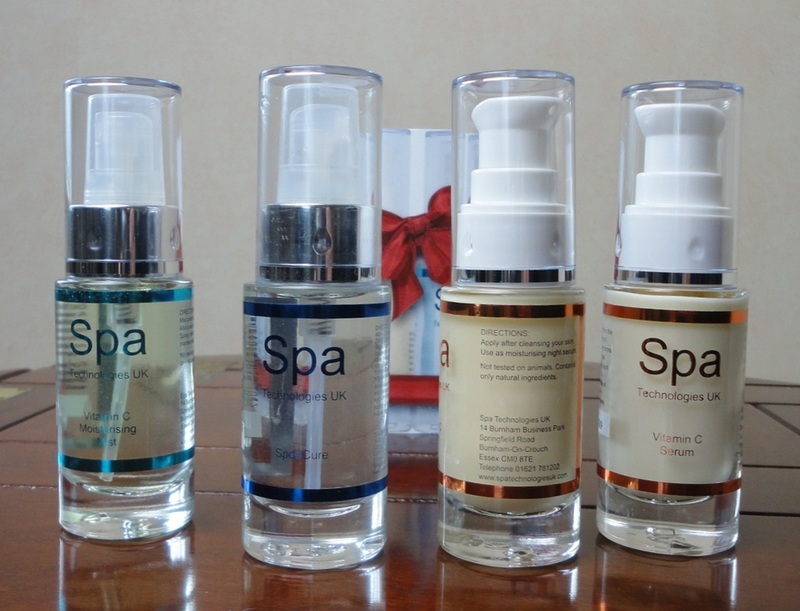 Like the rest of the Spa Technologies range, the ingredients are all natural and non-toxic, it contains no parabens, sulphates or artificial perfumes, it is gentle and suitable for the most sensitive skins, and is not tested on animals. I can see a difference in my skin and I believe this is one of those products that works better the longer you use it. I get an immediate sense of freshness but, in the long term, my skin texture seems to be improving as well. I also find it ideal just after derma-rolling my face and neck when the skin is tender and slightly irritated. The 30-day money-back guarantee is an added reason to give this a try. 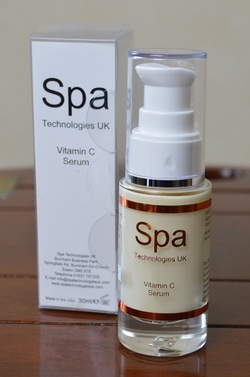 When this serum arrived, to ensure a fair assessment, I stopped using any other serums during my test period. After five weeks I am absolutely delighted with my results, especially because I had stupidly used a self-tanning product on my face (I'll never make that mistake again!) and reactivated stains and blotches that had previously faded away. Vitamin C products have worked well for me in the past but, even so, I was very pleasantly surprised to see the change in texture and the lightening of those horrible stains. I am almost 63 and my skin requires serious help. This serum is really special. The product is a silky liquid with the consistency of a lotion and the colour of cappuccino, and for me one or two squeezes of the pump dispenser is enough to cover face and neck. The clear glass bottle contains 30 ml which lasted me well over a month. Like all good serums, it increases the action of whatever cream you apply next by facilitating absorption. When dry, I applied a night cream in the evenings, and a day cream and make-up in the morning. The serum makes a great base for foundation and powder, and I love how it smells, I can pick out lemon and vanilla and the tang of the sea. With this brand, I can be sure that all the ingredients are natural and as pure as possible. The full list speaks for itself: two kinds of Vitamin C, seaweed extracts, essential oils, all the most effective agents to tackle ageing skin and reduce environmental damage. This serum is one of the best I have tried so far. At my age, I cannot expect to fully erase lines and wrinkles but I believe that using effective skin care can slow down the inevitable process, and perhaps even reverse some of the more recent damage (as was the case with the sun spots). These products are not flashy in presentation but they work, and are certified Vegan and cruelty free. Also they are fully guaranteed, although I can't imagine anyone not being entirely delighted. The Vitamin C Serum and Moisturising Mist can be bought packaged together as the tArget Kit, saving you some money.